In three short years as President of SUNY Orange, Dr. Kristine Young has begun to significantly reshape the student experience, while at the same time expanding access to the College and cementing public-private partnerships that place SUNY Orange in the midst of academic and workforce training innovation. Now in her fourth year, having arrived as the College in June 2015, Young has successfully navigated the College through recent budgetary challenges and has managed to halt enrollment declines that had plagued the College for nearly a decade. The College witnessed substantial growth in online enrollment this Fall while overall enrollment leveled out. This past summer, SUNY Orange opened and dedicated its Sarfatti Education Center in Port Jervis, providing access to a selection of general education classes for residents in western Orange County, as well as prospective students in nearby towns in Pennsylvania and New Jersey. Seeking to better retain and graduate students, the College is in the second year of a “SUNY Orange Experience” initiative that will overhaul how the College ushers students through their academic career. SOEX will revamp student onboarding, advising, course scheduling and curriculum mapping. This expansive undertaking involves participation from all sectors of the College community and is bolstered by SUNY Orange’s selection as one of only eight community college participants in SUNY’s first-ever Guided Pathways Institute. At the same time, SUNY Orange is garnering public and private support for its “Innovation Grand Street” initiative that will spark private investment, create jobs, rejuvenate the greater Newburgh community and connect the College’s curriculum to real-world experiences for students. 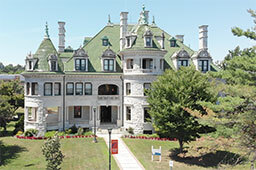 The project, which will focus on four business sectors, includes the renovation of three iconic buildings adjacent to the College’s Newburgh campus that will house dynamic maker/shared work spaces, allow for small business creation and incubation, and blend workforce training with complementary academic opportunities. In order to support an increasingly diverse student population, the College has initiated during Young’s tenure a TRIO Student Support Services (SSS) program (established via a $1.1 million grant from the United States Department of Education) to help increase the persistence, retention, graduation and transfer rates of low-income first generation students and students with disabilities. Additionally, a State University of New York grant has allowed the College to develop an Educational Opportunity Program (EOP) that provides access, academic support and financial aid counseling to low-income and academically underprepared students. SUNY Orange is recognized as a Hispanic-Serving Institution and has been named a “Veteran Friendly” college for four of the past six years. Grants have also helped the College increase peer-mentoring opportunities for students returning after having been separated for academic reasons. Young came to SUNY Orange following a 17-year tenure at Parkland College in Champaign, Ill. She first arrived at Parkland as a chemistry instructor in 1998 and steadily rose through the faculty and administrative ranks. As vice president for academic services at Parkland, a role she accepted on an interim basis in 2007 before being named to the post permanently in February 2008, Young provided leadership for 180 full-time faculty members, more than 400 part-time faculty, and 65 staff and administrators in academic services in support of more than 160 degree and certificate programs and several academic support units. Parkland serves approximately 8,500 credit students per semester. Although Young spent nearly two decades at Parkland, she is no stranger to the northeast, having been born in nearby Scranton, Pa., and raised in Moscow, Pa. She earned her bachelor’s degree in chemistry from Muhlenberg College in Allentown, Pa., in 1996 and her master’s degree in chemistry from the University of North Carolina at Chapel Hill in 1998. Through the Community College Executive Leadership Program, Young completed her doctorate in education from the University of Illinois Urbana-Champaign in 2007.